Will this video stand the test of time? I think it just might. This one is definitely one of my favorites. It really cracks me up. Nobody seems to like it but me though. So be it! 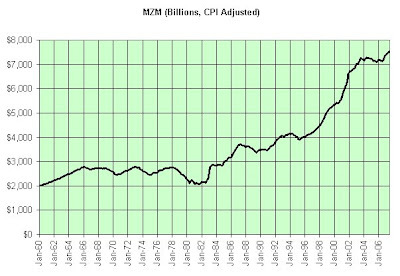 Here's a chart of the MZM adjusted for inflation over the years. Why isn't it just a horizontal flat line like the left side of the chart? Here's a song to listen to as you ponder the question. Here's a chart of weekly wages adjusted by the CPI-U over the years. There are many, many ways I could have put a line through those points. I chose a simple 2nd order polynomial. Maybe I'm too bearish. 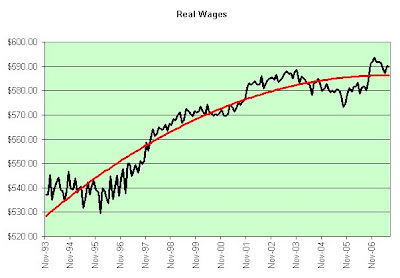 Maybe I shouldn't be concerned about how poorly wages have grown even as unemployment has fallen (and what might happen to wages should unemployment begin to rise again). Maybe I shouldn't be concerned about billions of foreign workers now competing with us. Maybe I shouldn't even be concerned about our banana republic level trade deficit. Maybe. JACKSON, Wyo. (AP) -- Federal Reserve Chairman Ben Bernanke vowed Friday to do all that is necessary to protect the national economy from the ill effects of a global credit crunch -- but not to bail out investors and lenders "from the consequences of their financial decisions." Haven't I heard this speech before? So help me if Bernanke says "evil doers" I'm movin' to Canada. I may be 43 years old but the Army keeps cranking up the enlistment age (currently 42). It's comin' for me. I can feel it! I believe he did provide a disclaimer though. Rumor has it that he also said, "As long as the levys don't break." Okay, I started the rumor. Right here. But it makes sense, doesn't it? Levys? As opposed to levees? Get it? Hahaha! *cough* *mumble* Um, all right, that was probably too easy. Friday's comments -- made in separate appearances -- by Bernanke here and the president in Washington, sought to send a reassuring but tough love message. . . .
Yeah, I haven't been this reassured since Bush and Cheney split up after 911. Can't be having our leaders get too close together when danger appears, lest nobody is left to run the country. While Bush announced steps Friday to help homeowners struggling to make their mortgage payments, he made clear he has no interest in bailing out lenders, some of whom got cocky, took on too much risk and ended up with bad loans. Yeah, can't have people get all cocky and stuff. Before you know it they'll be swaggering, invading foreign countries, and looking for SMDs (snarks of mass destruction) using borrowed money. In anxiously awaited remarks, Bernanke suggested the Fed's next move will be driven by economic considerations, not only in response to troubles of investors and lenders. Sweet. The Fed's moves will be driven by economic considerations. That puts to rest my fear that they were using astrological considerations. It is not the responsibility of the Federal Reserve -- nor would it be appropriate -- to protect lenders and investors from the consequences of their financial decisions," Bernanke said. "But. . . . If ifs and buts were candy and nuts we'd all have a deflationary Christmas. Bush, however, predicted the economy would get through the financial crisis and urged patience. What's his track record on convictions? Um, I mean predictions. Oh Freud! You devil! The unemployment rate, now at 4.6 percent, is expected to creep up to around 5 percent by the end of this year. How the heck did that slip in there? Last I heard unemployment was low? Who authorized people to start looking out the front window? I better stop there before my brain implodes. ``Gold is simply following stocks higher because of the Bush bailout,'' said Leonard Kaplan, president of Prospector Asset Management in Evanston, Illinois. I have a few really stupid questions to ask so bear with me. Is there any way that gold is simply higher because of the Bush bailout? Did we really need "stocks" in there to help connect the dots? If that doesn't work, can we at least be consistent? Precious metals are simply following stocks higher because of the Bush bailout. I feel so much better now. Let's not stop there though. Let's generalize it even further to put a nail in this coffin and drive the point home (inside joke for the MMI followers). One group of things are simply following another group of things higher because the Bush bailout props up yet another group of things. Oh yeah, that one works for me. Fantastic. In an attempt to see the forest through the trees here's a chart of the CPI-U's change over the previous five years (annualized). Granted, if the trend changes quickly this isn't the best chart to see the change. However, who says the trend is going to change quickly? Does anyone really know? 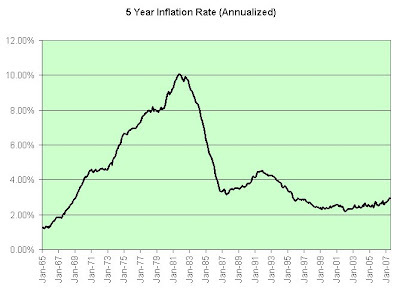 About the only thing that seems to bring the inflation trend on this chart down once it starts up is a recession. 1981-1982? Yep. 1990-1991? Yep. 2001? Well, sort of. Get the microscope out. So if I had to guess, and that's all it is, it looks like we're going to need a recession if we want inflation to really start coming down again. Who knows though? Maybe I'm just blowin' smoke. Smoke generated from burning oil that is. $74 oil. Oil that only averaged $58.30 in 2006. Oil that was $46.47 in 2005. Oil that was $38.93 in 2004. Oil that was $27.54 in 2003. Oil that was $22.51 just five years ago. Oil that is excluded from "core" inflation when determining inflationary trends because it is so volatile. Oil that's used to fertilize and harvest our food (which is also excluded from the "core" when determining inflationary trends). Oil that we rely on from other countries since production peaked here in the states. Oil that's currently positioned under our Army's feet in Iraq as if by some miraculous coincidence. Yeah, that oil. I'm not saying that we're clearly reaching peak oil right now. Our production peaked here in the USA though. There is a precedent. All I'm saying is that it would be nice to know. If we are peaking on a global scale, we can pretty much throw the whole idea of tame inflation right out the window. Yeah, yeah, I know. Inflation is purely a monetary phenomenon. Oh how that sentence tires me. Inflation is not necessarily just a monetary phenomenon. It is caused by too much money chasing too few goods. Either too much money can be printed OR too few goods can be made. Running out of oil implies too few goods, especially when it comes to food. Here's a chart I made a few years ago. 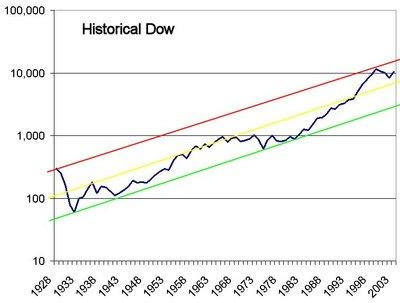 It made me realize that maybe, just maybe, it would be better to buy stocks when they were closer to the green line than they were to the red line. Of course, no financial advisor would ever tell you that. No sir. Stocks only go up over the long-term. Uh huh, okay. Of course, I have to ask myself why I wasn't making a chart like this in 1999. Oh, I remember. Ignorance was bliss. Fortunately (luckily?) I was a cheapskate. I didn't wish to pay 100 times earnings for a stock, much less pay large sums for a company with no earnings whatsover. Winners of the New World? To quote Jim Cramer, "You can have them." Assuming there is anything of worth in this chart (big assumption), I can't help but think we're still way too close to the red line for my liking. On the other hand, I wouldn't bet on it though. The long-term trend is up. You have to be very sure of yourself (arrogant) to think you are smarter than the market. One of those? All of those? Probably not. It will probably be something I wasn't smart enough to think of. Maybe a butterfly flaps its wings on some ethanol corn field as a hydrogen powered saltwater car drives by. Yeah, that's it. Saltwater is going to solve ALL our problems. It is the best invention since the ash powered train. Never heard of it? You put pre-burned wood (otherwise known as ash) in it and it generates electricity to power the. . . . Oh, wait! Black helicopters are circling my house again. I wasn't supposed to tell you that. Sorry. The oil companies and the government paid me off so that I wouldn't share my invention. I probably wasn't supposed to share that either come to think of it. 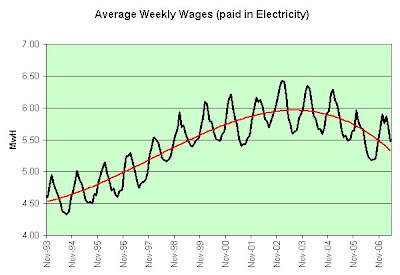 This chart represents how much the average worker (according to the BLS) would have been paid if he had been paid in electricity (according to the Department of Energy). Why electricity? Well, clearly oil is expensive. We can't very well be paying workers in oil! That would create anarchy. Surely we can't be running out of electricity though, right? As an added bonus, who wouldn't want to see a multi-megawatt-hour sized paycheck? In all seriousness, this chart may show three things. One, the price of oil is bleeding over into other areas and if the trend continues we're going to be hurting. Two, maybe we better rethink the idea that we can all live in McMansions. Three, if electricity is any indicator we've been living in an "illusion of prosperity" since 2002. You knew I'd work in the name of my blog at some point. I can't help myself. I'll stop being overly hammy when the country stops being overly leveraged. Deal? Expect crazy charts here. I don't see much point in posting charts you can find elsewhere. I created this chart using the latest data on our economy. I'd supply the source data but there are times when I'll want to keep some things shrouded in mystery. I think it adds to the mood. I'm hoping you can appreciate charts that have an aura of conspiracy about them. Just between you and me, if the government only knew what I almost know. . . . In the mid-90s I began investing. It started with a small investment in several rather conservative blue chip stocks. From there I made an investment in Wizards of the Coast. It was a small private company. I believed strongly in their product and that's probably one of the best reasons to invest there can be. In fact, to emphasize how much I believed in their product I continued to drive my Hyundai (Hope You Understand Nothing's Dependable And Inexpsensive) rather than buy a new car I could certainly afford. It was the best investment decision of my life. In 1997, I cashed out my blue chip investments to make a downpayment on my house. I'm still living here. In 1999, the Wizards of the Coast investment began to payoff. I paid off my house, much to the dismay of my tax preparer. She felt I could earn more than that investing in the stock market. Well, so much for that theory! As more money started to come in from the Wizards of the Coast investment, I put it to work in the markets. Timing could have been a bit better, as you can imagine. I was 80% in the stock market when the dotcom bubble burst. Fortunately, I did not own any dotcom stocks. Other than the small amount of dabbling I did in Nortel and a few others, I came through that period relatively unscathed. One of my stocks, Hansen, did especially well. It rose six fold by the time I sold it. Hindsight shows it rose another ten fold after that. Oh well! Caterpillar, Citigroup, and FedEx also helped to offset my losses elsewhere, and yes, I did have some real stinkers. Overall though, I did as well as a CD in the bank from 1999 to 2004, so I can hardly complain. Avoiding fraud seems to be my life's work. It was front page news where I worked. Look up Cendant to see why. Not quite as bad as Worldcom and Enron, but that's not saying much. Speaking of stinkers, the fundamentals pulled me into Conseco and Healthsouth or so I thought, but the fraud and false promises (boy was I naive!) there had me running for cover. Fortunately, I didn't ride either of them down to the bottom. Fraud, fraud, fraud. It was at that point I realized that one's gut is sometimes better than one's brain. In 2004, my gut was complaining. It was telling me that we were just borrowing this recovery. The dollar kept falling. The stock market kept rising. I'd look over at rocks (gold and silver) and think that I'm not really keeping up. So, in 2004 I exited the stock market and opted to own the rocks instead. Two years later, as both started turning parabolic, I sold for a tidy profit. I'm now sitting in TIPS (Treasury Inflation Protected Securities), I-Bonds, and three month treasury bills. I'm bearish as ever on the economy. I'm not prepared to short stocks though. It is a bit too much like shorting inflation in my mind. I look at the housing market and it scares the heck out of me. What are people thinking? In 2004, I was somewhat concerned about hyperinflation (with interest rates at 1% who wouldn't be?). Now I'm starting to warm up to the idea of deflation, at least as it relates to housing prices. What about the grocery store though? Will we see deflation there? I don't think so. My gut says that we'll be looking at a mildly stagflationary environment. Some things are going to deflate. Some things are going to inflate. Probably best to just sit on the sidelines in relative safety. Some would say that I shouldn't trust the government CPI. Some say that inflation is running MUCH hotter than that. I don't agree. I track my expenses to the penny. Some things are inflating (gasoline) but not all things. The shoes I buy at Costco are the same $14.99 they were many years ago. No, I think when inflation appears, we'll know it. Inflation in China is picking up and at some point their ability to "ship" us deflation will come to an end. In fact, even our government supplied inflation has been running hotter this year than most seem to realize. If not for last fall's commodity selloff the headline year over year inflation number would look downright ugly. Is anyone talking about that though? Of course not. I guess everyone just assumes we're getting another massive commodity selloff this year. While possible, I wouldn't count on it. Without it, hello ugly inflation numbers come October and November. I've read how the government computes the CPI. For the most part I'm comfortable with it. It does not exclude food and energy, contrary to what some would say. The only reason core inflation (excluding food and energy) is used is to help predict future inflation. It might be used to justify the current inflation, but food and energy are included when the value of TIPS are calculated (and that's all I really care about). It also does not exclude housing. It just seems that way. It uses rental prices. If the housing boom is sustainable, then those price increases will find their way to rising rents. If the housing boom is not sustainable, then using rental prices was indeed the accurate way to measure it. Either way, rental prices seem a fine way to measure that component of the CPI. The government chose rental prices for this very reason. It shelters the CPI from irrational movements in housing prices. Disclaimer time: Please don't trust the opinions of a random Internet poster. I'm doing this for entertainment purposes (and most likely just to amuse myself). 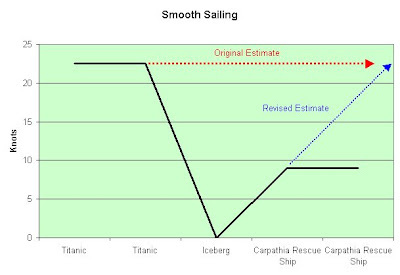 If I supply charts and they clearly aren't just for attempted humor's sake, then I've more than likely tried to use accurate data. The key word here is "tried". I'm not a computer. I can make mistakes. I'm the last person to say I have all the answers. I have far more questions and even the answers I think I know might very well be dead wrong.